The Antikythera Mechanism is an remarkable analog computer. Used to calculate astronomical events such as the location of the moon & sun it could even predict solar eclipses. Some believe that it was also able to track the positions of the 5 known planets. It has mechanism for showing which Olympic games were being held in the current year which is not as scientifically interesting but was culturally significant for the Greeks that built and used it over 2000 years ago. With an estimated manufacturing date of 86 B.C. it is a truly remarkable feat of technology that was unmatched in its accuracy and ambition until the 14th century A.D.. Discovered off the coast of the Greek Island Antikythera in 1901 it was found in a Roman ship that may have been returning spoils of war to Julius Caesar. It was initially set as aside and thought to be far less significant than the statues that rested on the sea floor nearby. Even after a researcher noticed a gear embedded in the “lump of rock” two years after it was brought up it’s significance was undervalued. Dismissed as being far too old to be an astronomical clock it wasn’t until English physicist Derek J. de Solla Price became interested in it in 1951 that the research started in earnest1. Experts believe it to be the earliest-known device to use gear wheels and by far the most sophisticated object to be found from the ancient and medieval periods. This device is extraordinary, the only thing of its kind. The astronomy is exactly right … in terms of historic and scarcity value, I have to regard this mechanism as being more valuable than the Mona Lisa. It has taken over one hundred years, a three ton X-Ray machine, high-resolution surface scanning and countless working hours to finally suss out these details. For a closer look at the device I highly recommend these two videos from The Nature Journal. They introduce the researchers, some of the remarkable devices used to study the artifact as well as Don Unwin; an the adorable old man commissioned to build a replica. 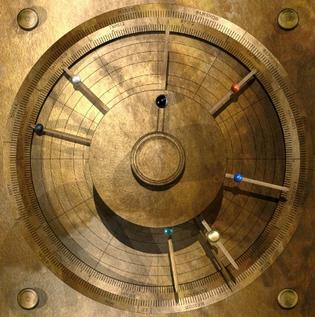 You are currently reading Antikythera Mechanism at Thomas Paine Rants.